The R-PLEX Human IL-6R Antibody Set includes a matched capture and detection antibody pair and calibrator for the quick and easy measurement of IL-6R in biological samples. R-PLEX products leverage MSD’s electrochemiluminescence technology for better sensitivity and a larger dynamic range than traditional ELISAs. R-PLEX matched antibody sets enable the development of singleplex and multiplex immunoassays. Individual assays may be developed using MSD avidin- or streptavidin-coated plates. Custom multiplex assays with any combination of R-PLEX analytes, as well as R-PLEX plus U-PLEX analytes can be developed on U-PLEX MULTI-SPOT plates. To learn more about the advantages of R-PLEX products click here. 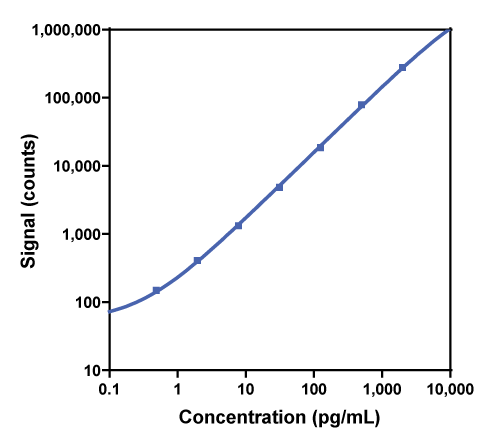 Calibration curve for the R-PLEX Human IL-6R Antibody Set was assessed and representative data is presented below. Description - Interleukin-6 Receptor (IL-6R, IL6Q, gp80, CD126, IL6RA, IL6RQ) is the receptor for a multi-functional cytokine that is produced by a variety of cell types. The receptor consists of two distinct membrane bound subunits, an 80 kDa alpha subunit (IL-6R) and a 130 kDa signal-transducing beta subunit (gp130). IL-6R is expressed by hepatocytes, monocytes, neutrophils, T cells, and B cells. IL-6 interacts with IL-6R with low affinity. The assay was developed to recognize the soluble version (Leu20-Asp358) /extracellular domain of IL-6R. The antibodies bind to the IL-6R subunit of the heterodimer (IL-6R/gp130). The assay should recognize monomer and heterodimer (interference testing has been done with GP130). The histone deacetylase inhibitor UCL67022 has potent activity in multiple myeloma and non-Hodgkin lymphoma pre-clinical models. A CD4 T cell gene signature for early rheumatoid arthritis implicates interleukin 6-mediated STAT3 signalling, particularly in anti-citrullinated peptide antibody-negative disease.